Shabu-shabu, or Japanese hot pot, is a popular dish containing beef, pork, chicken, vegetables, and tofu. Learn how to eat it properly and recommended restaurants throughout Tokyo and Japan where you can try it. Shabu-shabu, well-known Japanese nabe hot pot, is a dish that can be shared with friends and family. It is traditionally made in a shareable pot placed on the center of a table and is enjoyed in both homes and at restaurants. Shabu-shabu contains ingredients like thinly-sliced wagyu beef, pork, tofu, and fresh vegetables are cooked quickly in simmering soup. Different dipping sauces in add flavor to the ingredients. 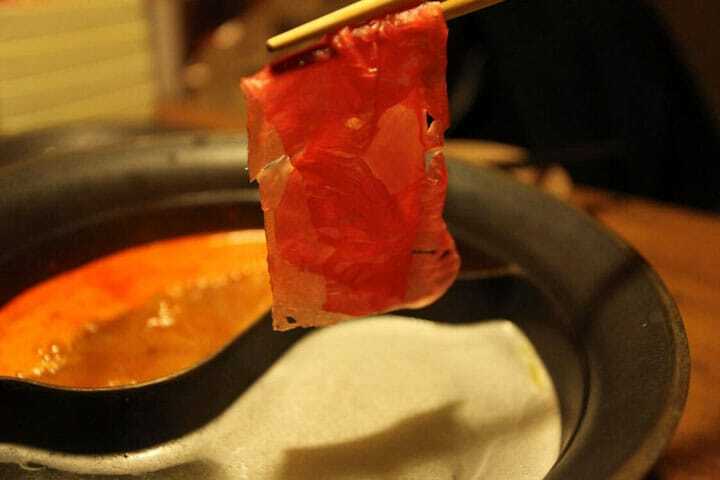 Typically beef is used in shabu-shabu as the centerpiece, but you will also see restaurants with pork and chicken, as well as amberjack, blowfish, octopus, sea bream, snow crab and other seafood. Fresh vegetables including onions, Chinese cabbage, Japanese radish, carrot, edible chrysanthemum, shiitake and enoki mushrooms, tofu, and other ingredients are all simmered together with the main ingredients. If the meat used in shabu-shabu is beef, then it is called gyu-shabu, and if the meat is pork, it is called buta-shabu. How Do You Eat Shabu-Shabu? At a shabu-shabu restaurant, a plate of the main ingredient, a hotpot filled with broth from konbu seaweed, and other ingredients are brought to your table. Turn on the burner under the hotpot, and wait for the soup to come to a boil. While you wait, it is a good idea to put your preferred yakumi(*1) and sauce in a saucer. Shabu-shabu sauces are generally either ponzu(*2) or goma-dare(*3). As for the yakumi, either momiji oroshi (a daikon radish slit open, filled with chili pepper, then grated) or minced onions are popular garnishes. The light pink momiji oroshi and green onions make the food a feast for the eyes. Once the soup is boiling, put in the ingredients that do not easily heat all the way through (like onions, daikon radish slices, and tofu). Once it comes to a boil for the second time, take a slice of meat with your chopsticks and swish it around in the soup to heat it, as though you are taking it for a swim. This movement is called "shabu-shabu," and is the reason for the name of the dish. Beef or seafood can be eaten half-cooked once their color starts to change. However, wait for pork to cook all the way through in the soup. While the meat is still hot, dip it in the sauce and yakumi, and enjoy. *1: Yakumi: A kind of condiment. Often refers to minced onion or grated radish. Used for enhancing flavors, adding color to stimulate appetite, and depending on the situation, for its sterilization properties. *2: Ponzu: A refreshing condiment, made from vinegar and soy sauce added to juice from Japanese citrus fruit. *3: Gomadare: A condiment made by mashing sesame seeds made into a paste, then adding soy sauce, vinegar, rice wine vinegar, and sugar. For the final ingredients, it is custom to add udon, ramen, or other noodles or rice. This is called "shime" in Japanese, which means "the end." The soup, which has absorbed all the flavors of the ingredients by the end of the meal, will make whatever noodle or rice you add taste very delicious. The picture above shows cooked rice put it in the soup until it becomes slightly soft, along with a beaten egg cooked until it's half-done. This makes zosui shime, a type of rice porridge. For noodles, you can usually choose udon or ramen noodles but it depends on the restaurant. There are many restaurants in Japan where you can enjoy shabu-shabu, from small restaurants to chain stores. They often have all-you-can-eat options. Here are three restaurants we recommend for visitors wanting to try this traditional dish. Nabe-zo is a restaurant chain with locations in Shinjuku, Shibuya, and other areas in Tokyo, Kanagawa, and Saitama. Diners can choose all-you-can-eat options with beef, pork, and fresh vegetables here for 100 minutes. The restaurant has foreign language support, including English, Korean, and Chinese, so international visitors can feel at ease coming here for a meal. Prices start from around 2,500 yen per person. Onyasai is a shabu-shabu restaurant with locations across Japan. It is known for having a large menu and is a popular choice of many diners. Guests can choose from pork and beef all-you-can-eat courses that start from around 2,780 yen per person and last for 120 minutes. Hanasaka Ji-san is a restaurant in Shibuya, Tokyo that is halal-certified and ideal for Muslim travelers. It specializes in high-quality beef from Miyazaki Prefecture, and also offers other Japanese dishes to diners. This is a restaurant great for a special celebratory night. Prices range from 4,000 yen per person. The restaurant has English support and a website in English.